A stereotyped accompaniment played on a keyboard instrument with the left hand. The chords of the Alberti bass are played as arpeggios, or broken chords. Named for Domenico Alberti ca. (1710 - 1740) who used them extensively, they are quite common to the works of Franz Joseph Haydn, Wolfgang Amadeus Mozart, and early Ludwig van Beethoven. The Alberti bass pattern uses a three pitch chord with the pattern - lowest pitch - highest pitch - middle pitch - highest pitch. 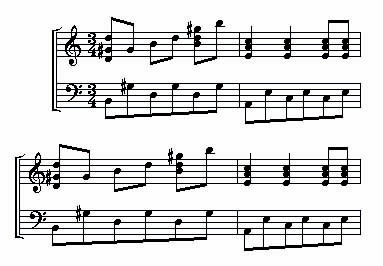 The example shows the pattern of B - G sharp - D - G sharp (lowest pitch - highest pitch - middle pitch - highest pitch) . This example is also in triple meter, so the third beat repeats the pattern of the second beat . A duple meter would employ the pattern as described. Alberti bass refers only to this pattern and not to any arpeggiated pattern or broken chords played in the left hand.